How cute!! I would love to win! Already “liked” Totally Target on facebook a long time ago. Thanks Totally Target! Merry Target gift card Wow! I read your site everyday! Totally Target rocks! Hapyy Holidays to all!!! Well I do love Target and I would love a Target gift card even more! Love your site and as much fun as it would be to win, it’s even more fun to have all the great savings that you help us to have year round. Thank you so much! Merry Christmas! Here’s my second entry, I forgot to mention that I liked totallytarget on facebook not long ago. Again, thank you for the awesome work you do to make our saving a lot easier! Merry Christmas! love this site! Such wonderful ideas!!Thanks! Cool gift card! Please pick me! Love the gift card and your site! I love Target and need to finish my shopping!! And I’m already a FB fan! Thanks for the giveaways!! Merry Christmas!! What a cute card! 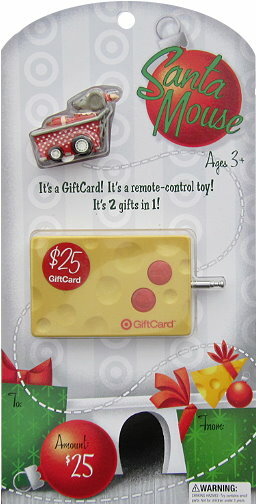 My girls would love the mouse more than the card…Of course, Mom would love the gift card a bit more. Great site! Thank you for all you do! Sorry forgot to say that of course I “like” TT on FB! I use your site often. Thank you! Thanks for all the help and insight-I even got the free plugins last week thanks to you!